Happy Anniversary to me and the man I married! We studied together, live together, worked together and travel together. The fact that we are not completely sick of each other is a miracle. The glue that keeps us together? It's food! We share the same obsession. And true love too - I guess that's pretty important. Although he won me over with homemade ice cream (remember he has a Master's degree in the field of ice cream, so my husband is an Ice Cream Master! ), today I am sharing a classic recipe. True love is nothing but class and giggles anyway. 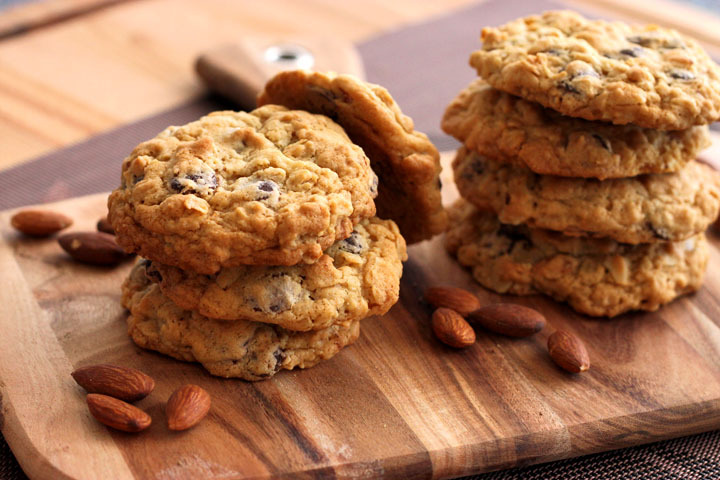 I am a big fan of oatmeal cookies and this is a no brainer recipe. You can easily memorize it since most measurements are 1/2 cup or 1 cup. The result is a crispy caramelized circumference with a soft and chewy center. Just a tablespoon of milk adds extra moisture that will be sucked up by the oats to give the soft chewiness. A half an hour resting time allows this hydration to happen so don't skip that step. Another trick is the use of flaked almonds which have a high surface area and will also absorb more moisture than chopped or whole ones. I strongly suggest sticking to it, but if you don't have any on hand then you should maybe increase the amount of flour by 1 tablespoon. I make these often and I make them with love. They are a classic and they are comforting. They beg to be shared with big and small hands! Cream together butter and both sugars until somewhat light and fluffy, but still a tad grainy. A minute or two should do it. Beat in egg until well combined. Stir in milk and vanilla extract. In a separate bowl, combine flour, baking soda, baking powder and salt and whisk to blend. Add flour mixture to the butter mixture and stir until just combined. 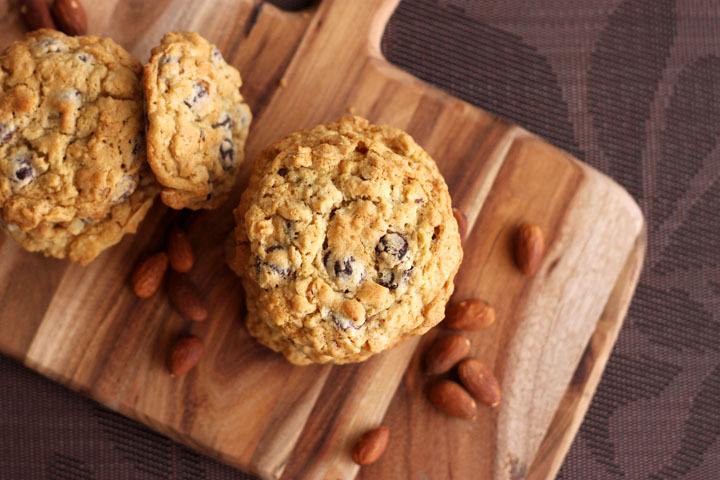 Fold through rolled oats, chocolate chips and flaked almonds until evenly mixed. Cover bowl with a tea towel and set aside for 30 minutes. Meanwhile, preheat your oven to 350 degrees F. Line two large baking trays with parchment paper. When ready to bake, place heated tablespoons of dough on prepared baking tray spacing them 2 inches apart and bake for 12-13 minutes or until golden brown. Love your blog!! When you say flaked almonds do you mean slivered almonds. In the US we don't have flaked almonds that I'm aware of. Patty R.
Hi! Flaked almonds are the same as sliced almonds.